And then I remembered: my vision... All the people I loved being drawn against our wills, unable to turn back, going to a world we did not know, somewhere we did not want to go. 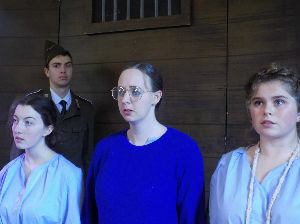 Oddments Theatre Company brings ‘The Hiding Place’ – the inspirational and heart wrenching testimony of Corrie ten Boom, to life in their latest production –. Corrie, born on April 15, 1892 in Haarlem, Holland, and her Christian family are outraged at the German occupation in the Second World War, and the constant persecution of the Jewish community. Her sister, Betsie, and father, Casper, join Corrie and thousands of others in the unceasing resistance of God’s underground. Their refusal to stand by and watch the Nazi’s horrendous onslaught, and their faith that prevails throughout their subsequent suffering of the Second World War’s darkest terrors, continues to inspire all of those who encounter Corrie’s incredible story. Oddments are one of the few full-time Christian Theatre Companies in the UK. Based in Yeovil, Somerset, they are a registered charity reaching out to churches, schools, and prisons. 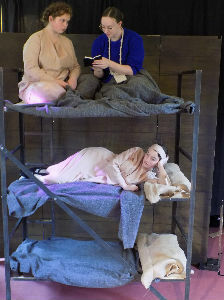 The Hiding Place is currently brought to you by a production team of six performers whom, alongside an exciting, rotating stage set, music, and lively stage action, will make you laugh before they make you cry. Rated 5 stars by audience members, you will not be disappointed by this passionate story of God's love and hope in amidst an environment of darkness and brutality. Described by the audience as - "a powerful performance showing how God's love can overcome hatred and evil” and - “an inspiration to us all", we can guarantee it is a show not to miss. Corrie and her family’s incredible story is timeless, and Oddments truly capture the Christian message in a new and encouraging way. The play is rated a five star show consistently by our audiences. 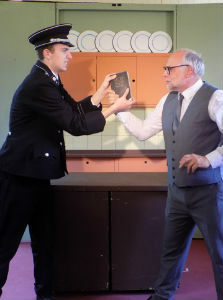 Oddments Theatre Company are coming to Fishponds Baptist Church on 28th March at 7pm with their production of 'The Hiding Place'.